Before attending an interview session, you need to make your resume highlighting your experiences and education details, list of the projects you have handled, list of the procedures practiced, any certification copies, recommendation letters, and references if any. The interview session would mostly comprise of technical aspects but be prepared for non-technical as well. Nowadays, the character sketch of the person is more important for success of the business as a whole. 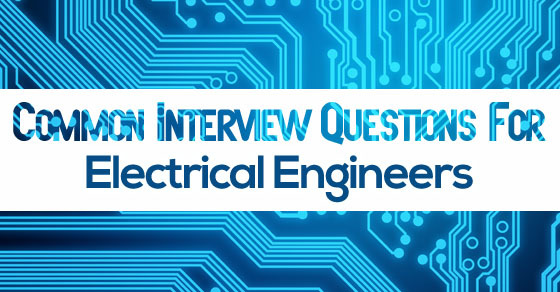 Let’s review some of the non-technical and technical interview questions for electric engineers. The following mentioned are few important electrical engineering questions and answers. This being the foremost question, you probably are aware that you need to provide details of your education that includes from higher secondary certification up to your undergraduate and/ or postgraduate certification. Don’t forget to tell a little about various organization you are member of and other social sites, to indicate that you are professionally updating yourself. Here you need to mention about what the subject was and what fascinated you the most. You could have picked it up from your school days or because of an elder sibling in the family. Brief on the way you picked up flare for it and also succeed in it. There is a need to give or indicate your cumulative grades with average for all the year together. Besides elaborate on which subjects were of interest and where you had performed well. Indicating about the various performances would highlight what you excel in and also tell about your experience in that field or subject. Giving a description about your personality traits and characteristics attributes is required here. Include how good you are at communication, good in solving problems, patient with co-workers, having positive attitude, looking into details, supporting others. Most of the work requires co-ordination and co-operation, hence indicate people who would work in co-ordination as a team. Brief those about the way various types of work has to be executed like commissioning of equipment’s or transformers require a team. Have a word on positive mind, helping nature and those who show appreciation and support into your description. This is mostly posed to know your style of work, how would you interact and mainly about your personality. Tell about your strengths first so that it would contribute towards a positive outcome. Begin with strengths citing examples that was evident in your work performance. For example you could tell about planning skills, being a hard worker, being punctual, being able to solve problems, maintaining good quality work, finishing projects on time, meeting deadlines, achieving objectives, taking criticism positively. In case you have some weak points about yourself, for example, like being stubborn, impatient, being unassertive, reluctant to share, being sensitive, etc then do say it honestly. But beware of giving out too much that may not be required to. Explain in detail about the issue and how it started. What were the procedures you had to take, minimizes its risk. Besides you need to elaborate how did you detect the fault or how did you become part of the work. Also, tell more on the different aspects that you had to review to find the solution and what steps were taken to implement it. If you had involved a team, do indicate the team’s efforts on how you performed as the leader of the team. 8. What were the roles you had taken up during your work period? This requires for you to indicate what posts you were assigned to. If you are looking towards a higher profile, then you could start from the scratch till the level you are. There is no harm in saying it as it would mean that you had learnt the various phases of work and would be profoundly well equipped with information. Besides, each role you play would carry a lot of significance telling your skill of being in a team and having patient throughout the journey. 9. Which part of the project fascinated you and why? Employer would be interested to know about your experience in a specific project that captures their attention. Hence, you need to be well prepared with at least the major aspects of all the projects before coming for interview. Once you are aware of the aspects, then it will help you to identify the best moments or the interesting facts about the work carried out. It could be something like the team whom you worked for or the way the work was executed or the support shown by management. Whatever small it may seem, but those are your observations which they would like to know. 10. What type of cables are used for transmissions? As you know that cables are required for transmitting power, give a brief on the various types namely the low tension cables use for transmitting up to 1000V, high tension cables for up to 23000V, and super tension cables that transmit from 66KV to 132KV. 11. Why is AC systems preferred to DC systems? Explain that AC systems are easy to maintain and change and involves less cost for transmission of power. Also you could say that power stations current produced is AC so there is no need to convert. Indicate that when a fault occurs in the network, it is easier to interrupt. 12. What is the difference between generator and alternator? You would need to say that both the devices have same principle, the difference is their construction only. Generator has stationary magnetic field with conductor rotating while alternator has stationary armature and rotating magnetic field. 13. What is the basic loading condition for transformer and its life expectancy? When the transformer is loaded at kilovolt Ampere its life expectancy is around 20 years provided the tower is at height of 1000m (3300ft.) where the ambient temperature is around 30deg.C and not exceeding 40deg.C. Such type of answer can be given when electrical interview questions on transformer is posed. 14. What are the possible causes for low power factor? You need to say about Inductive load where the difference in phase angle between current and voltage if lags at 90 deg. Causing zero power factor. The factors are Induction motors, variations in power system, electrical discharge lamps, and harmonic currents. 15. Why motor are rated as KW while transformer rated in kVA? You need to express that motor is the device converting electrical energy to mechanical energy. The load here is not electrical but mechanical which is expressed in terms of actual load or active power. The motor has fixed power while transformer depends on connected load or in other words the resistive load. You could define that air conditioner are basically designed to remove heat from inside the room of specific area. So it means the air conditioner is able to remove 1000 kilocalories of heat in an hour. 17. If I have a 25kVA generator, how many 2 Ton Air conditioner can be used? For this you need to do a small calculation. Firstly convert 2T to kW or W so you answer would be 7032W. Next considering the efficiency of the generator to be 90%, you can say that it can be rated as 22.5kVA. Hence, dividing power of generator by air conditioner (22.5 / 7032), you can say that 3 air conditioner can be run using that generator. 18. You would be aware that transformer has an insulating oil, which oil is that? When such type of transformer interview questions are asked, you need to say that highly refined mineral oil is mostly considered as transformer oil or insulating oil as it is stable at high temperatures and good electrical insulating properties. Elaborate on the properties of the oil as in terms of flash point, pour point and its functions as a coolant. 19. You may have noticed there are fuse and circuit breakers. What is the difference between the both? You need to say first that the function of fuse is to detect and interrupt while circuit breaker functions as interrupter. Also you could say that breaking capacity and the operating time of fuse is smaller when compared to circuit breaker. The circuit breaker does not require a replacement like the fuse which needs to be replaced. 20. Could you explain about reverse power relay? You have to talk about function of reverse power relay in which it prevents the reverse power flow from bus bar to generator. Also include the point that the condition occurs when the prime mover fails that is required to drive the turbine or engine. 21. What would be your goals in electrical engineering scope of work? Here you need to define what specific goals may relate to your personal life. If you haven’t decided on it then just indicate that you are working towards making a good career growth wherein there is space for learning as well. If you have then its good. Give an indication of what do you intend to see yourself a few years down the line. 22. How do you associate with your team? Can you explain about your previous experience? Get to speak out your team work skills that you have executed in you projects. Quote a few examples where you would have co-ordinated the various stages of erecting the equipment with mechanical team. Even for making an erection or commissioning of one instrument requires a lot of co-ordination. Explain what your roles were and what you had to do to see that all the work had been executed on time. You would have made a lot of suggestions for following safety norms. Do indicate them too. Especially working with electrical components do require safety measures. Now is the time to show all the skills that you had gained during your academics and at work place. Give an insight to them about the various feats and projects you had worked on. You could tell about the receipt of awards during your academics and work period. 24. Given an opportunity for you to do management would you be interested in it? If you want to get into the category of management group then you could opt for studying this course. There are various disciplines under them where you could use the skills gained so far and put them to use. Like for instance there are chances for position in Operations management. But if you do not have interest in it do not push it out and say ‘no’ . It’s better to accept any opportunity that comes your way. Probably with your team coaching or team motivating skills, you could land up the management level later on. 25. What interests you during your free time? By indicating your interests the other side of you would give glimpse of other attributes that are hidden. Sometimes the nature of spending time with familiar indicates that you are caring and understanding. Even showing interests of drawing or painting will show that you are a creative person and would be full of ideas. People who indicate reading as a habit means that they would be careful in their work and would be clear in their communication. The above mentioned are few electrical interview questions and answers. There are many ways to go into technical based question but that depends on what sort of industry or work field you are going to work. So better equip yourself with basic understanding and all the projects you had done. Never leave the session without getting to know about their goals, the type of projects they do, whether they had growth, what would be your role and goals if appointed. Always keep a smiling face and answer with positivity. Always take care to show respect and be honest in your remarks.